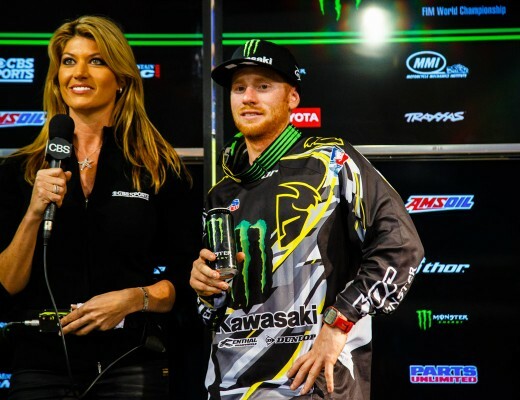 ST. LOUIS (March 3, 2012) – Monster Energy Kawasaki’s Ryan Villopoto, of Poulsbo, Wash., won his fifth Monster Energy AMA Supercross, an FIM World Championship, race at Edward Jones Dome before a record-breaking 59,742 fans. GEICO Honda’s Justin Barcia, of Ochlocknee, Ga., won his third consecutive Eastern Regional Supercross Lites Class Main Event and extended his points lead to 18 points. JGRMX/Toyota/Yamaha’s Davi Millsaps, of Murrieta, Calif., won the Nuclear Cowboyz® Holeshot Award with Villopoto and Muscle Milk Honda’s Justin Brayton, of Murrieta, Calif., in tow. JGRMX/Toyota/Yamaha’s James Stewart started near the back of the pack and crashed on the opening lap. 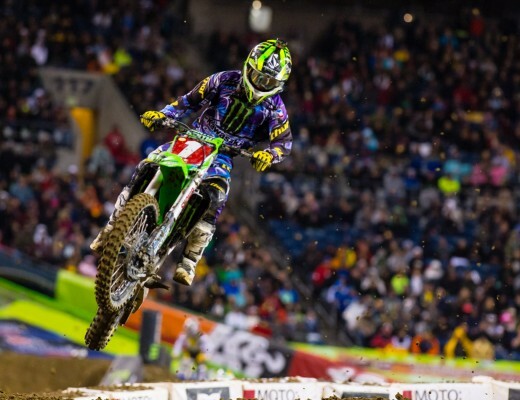 Villopoto, who has never won in St. Louis, quickly moved into second place. On Lap 2, Villopoto gained the lead after passing Millsaps and began opening a sizeable lead. Brayton passed Millsaps on Lap 8 for second place, and on the same lap Red Bull KTM’s Ryan Dungey, of Belle Plaine, Minn., passed Millsaps for third place. On Lap 13, Dungey took over second place, moving Brayton back to third. On his charge back from near last place, Stewart passed Millsaps for fifth place. Dungey made a late-race run at Villopoto but was unable to challenge for the lead. Dungey earned his seventh podium finish of the year with a second place. Brayton finished a season-best third place. Barcia made a statement when the gates dropped for the Eastern Regional Supercross Lites Class Main Event as he captured his second consecutive Nuclear Cowboyz Holeshot Award. Behind him, Red Bull KTM’s Ken Roczen, of Murrieta, Calif., and GEICO Honda’s Justin Bogle, of Cushing, Okla., followed in second and third, respectively. While Barcia extended his lead, Bogle stalked Roczen for several laps, and on the last lap while setting up his move, he suffered a crash. As a result, he lost third place to Rockstar Energy Racing Suzuki’s Blake Wharton, of Beaumont, Texas, and fourth place to Monster Energy/Pro Circuit/Kawasaki’s Darryn Durham, of Butler, Pa., where they would finish. Bogle was forced to settle for fifth, and Roczen finished a season-best second place. Tonight’s win for Barcia marked his third consecutive inside the Edward Jones Dome, and he now is the all-time winningest Supercross Lites Class rider in St. Louis. Tune into the enhanced exclusive weekly video content from Supercross LIVE! 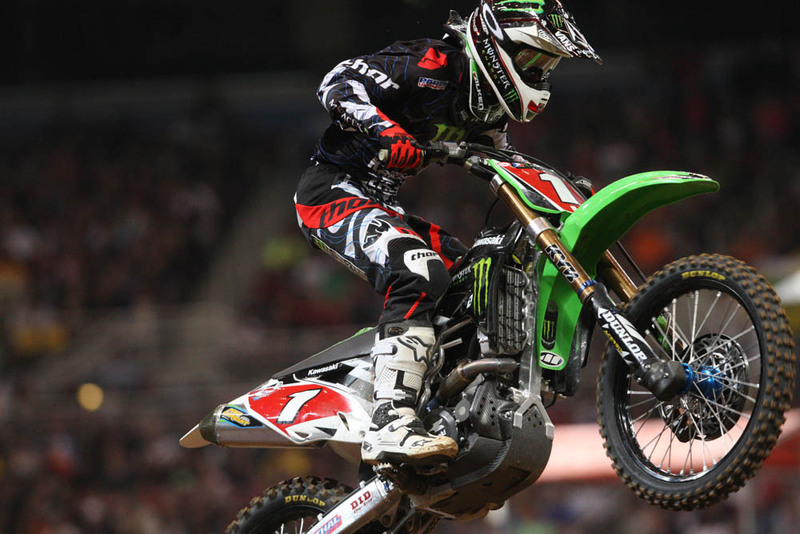 during the entire 2012 season on SupercrossOnline.com, the Official Website of Monster Energy Supercross.